Lazarus, my uncle’s 1976 Honda Gold Wing. This is a story about endings. 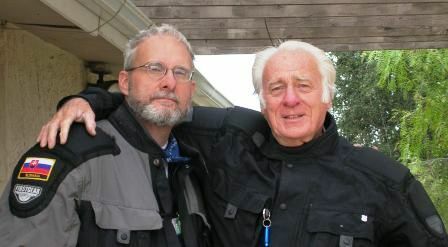 One of my favorite riding partners, my Uncle Robert, is in his late seventies and has given up his driver’s license. His eyesight and memory are starting to fail and we won’t be riding together anymore. My uncle (I’ve written about him here) was a distant but enduring inspiration to me in my youth. He graduated from high school in Cleveland, where my grandparents settled after World War II. After a stint in the Navy, he moved to San Diego and started a family there. 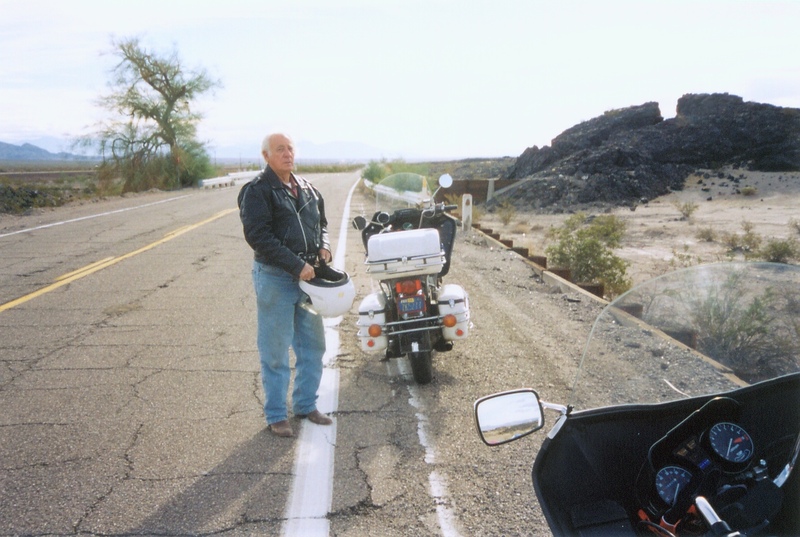 My Uncle Robert at a rest stop in Needles, California. He was the closest thing we had to a family legend; a police officer in San Diego, he rose to lieutenant and commanded the force’s SWAT team and he had done the most interesting things, traveling, writing, motorcycling, horseback riding. His stories filtered back to Ohio in letters and late-night phone calls, when long-distance rates were cheaper. His mythology started for me in February 1964, when he rode his year-old Honda Dream, a 305cc motorcycle, from San Diego to Cleveland. He was unprepared for the weather and got caught in a snowstorm and fell down on an icy street in Indiana, where he was rescued by a guy in a delivery truck. 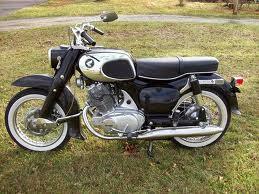 A brief aside: A 305 Dream with 28 hp and a 52-inch wheelbase, was considered a big bike in the early 1960s. Bikes have gotten larger since then. Terra Nova, for example, has 110 hp and a 61-inch wheelbase. By comparison, Linda’s 300cc Vespa scooter has 22 hp and a 54-inch wheelbase. My brother Rob found me a 1965 Dream at the swap meet at the AMA Vintage motorcycle Days in Lexington, Ohio (the same place we rescued a kitten five years ago, while riding home from San Diego). It is a small bike and I wonder how difficult it would be to ride across the country. I named it Santiago and I hope to restore it someday. Preparing Lazarus for a ride. My uncle made it to Cleveland on his scooter-sized motorcycle, surprising the hell out of my grandparents and the rest of our family. I was about six years old and I remember him in his black leather jacket when he came to see us. I thought he was the coolest guy in the world. I don’t know if I thought, “I’m gonna do that someday,” but his ride stayed with me, like a half-remembered note in the back pocket of an old pair of jeans. It wasn’t just the ride that made me admire him, it was the fact that he’d gotten out of Ohio and moved to Southern California, gone to college, and loved books and could write, like I wanted to. 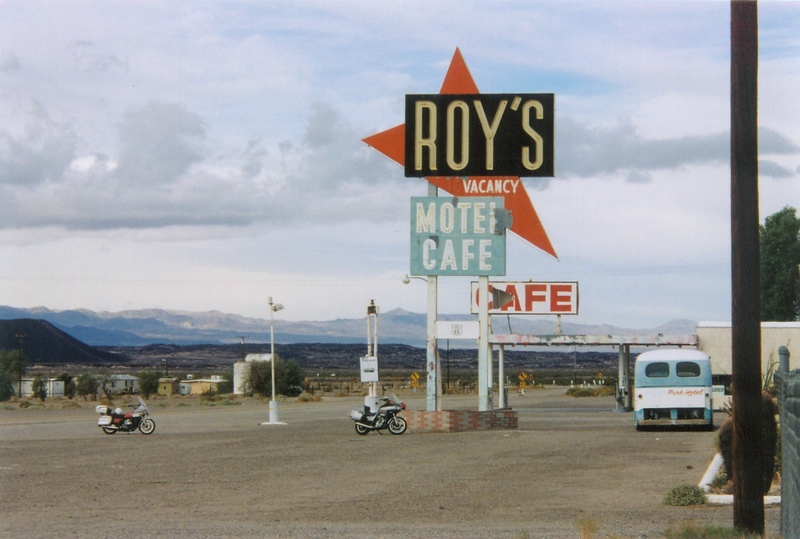 Roy’s Motel & Cafe in Amboy, Calif., on Route 66. That’s Lazarus on the left and the Silver Wing on the right. When I moved to Nevada, Discovery, my 1994 Yamaha Virago, was in the U-Haul trailer behind my pickup truck. We called these our Odysseys, and I can tick them off one after the other, like Apollo moon missions, because they were something we looked forward to every year, months of maps and late-night phone calls. They were the highlights of our summers. The 2002 ride was our best. We took the same route to Cleveland as he did in 1964, seeing the same sights and even eating at two of the restaurants he remembered. We stayed at my parents’ house, where I grew up, and it was a good time. Inspecting the original Route 66 in California. Things started to waver the next year. 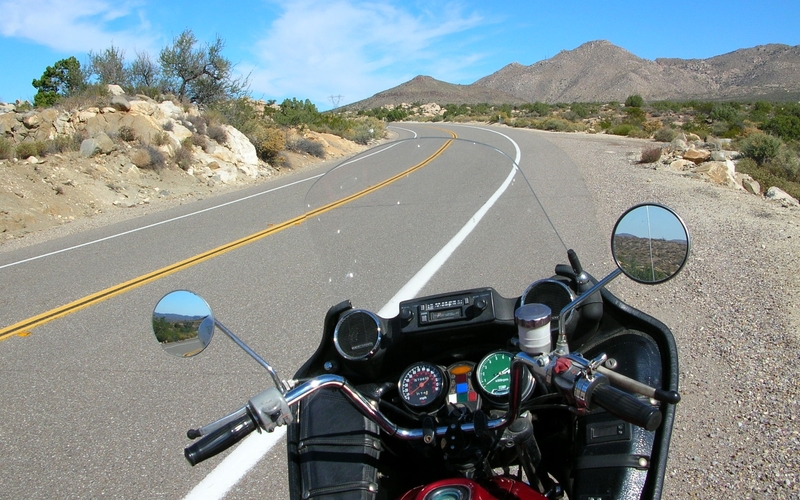 A planned ride to Inskip, Tennessee, for a mini-family gathering, had to be aborted in Florida because his bike broke down; he had to truck it back to California. We argued and it was not pleasant. 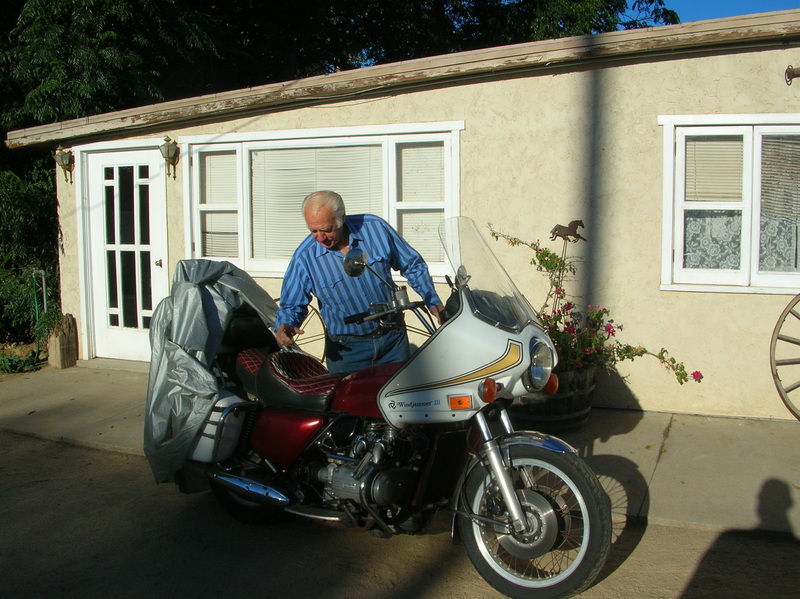 In 2004, I flew to San Diego from Washington, D.C., and borrowed his wife’s bike, a 1982 500cc Honda Silver Wing. We rode to LA and then east on Route 66, passing through Ludlow and Baghdad and Amboy and everything was absolutely great, the rift between us healed, and I was feeling something that I can only call a state of grace. 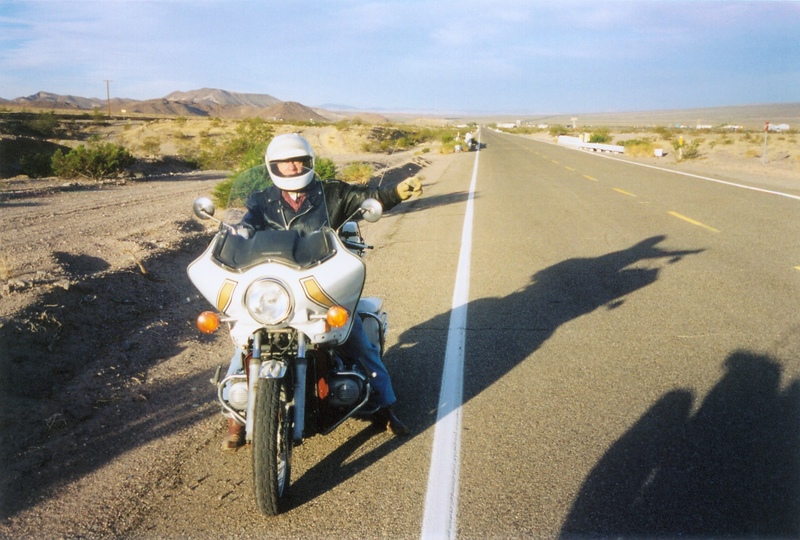 Then the Silver Wing’s front brake seized on an exit ramp near Bullhead City, Arizona, and threw me off the bike. I was going slowly but I hit the pavement and felt something pop in my left leg as the bike fell on it. We stopped at a motel and he had to pull the boot off my foot and my lower ankle was already swollen and turning purple. It later turned out the fibula, the smaller of the two bones between the knee and ankle, was fractured. That trip ended in a rental truck back to San Diego, too. But we had lunch in a Mexican restaurant and I told him that it had been a great ride and I was glad we’d done it, even though I’d fallen, and we smiled and clinked glasses across the table. But that was the end of our long rides. Linda and I rode from Washington to see my uncle and Suzanne for a few years after that. 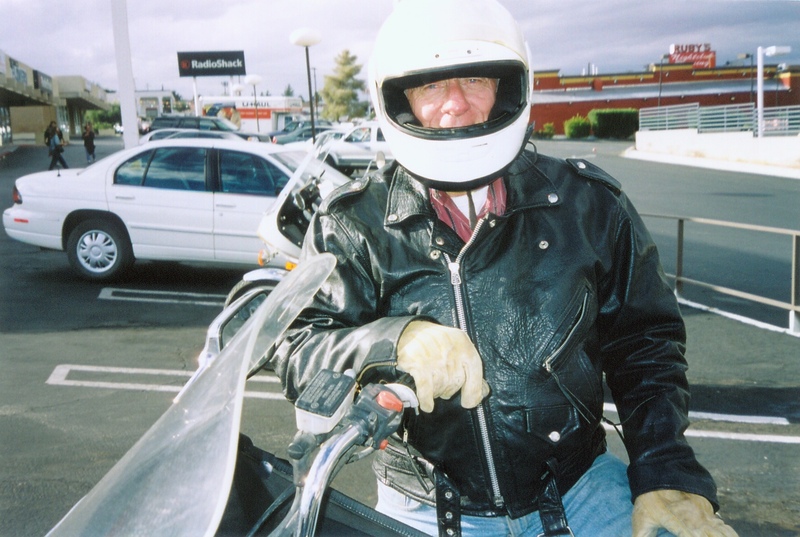 We did a few short rides around San Diego County and up to Julian but it really wasn’t the same, he was starting to feel his age and it was more difficult to keep his motorcycles street-worthy. And then Linda and I started visiting our relatives in Europe and riding motorcycles there and it got harder and harder to get back to California. In time, everything slips away from us, and my uncle has slipped away from me. Once again, we are on opposite sides of the country. We’re still friends and talk on the phone and I occasionally send him a book on motorcycling or Lawrence of Arabia or something. I wish we lived closer to him and his wife, so I could be a better part of their lives. Me and my Uncle Robert. All things may end, but I’m realizing we don’t have to walk away empty-handed. We have our memories, our good times together. And I find some comfort in knowing the kid who watched a guy in a black leather jacket wheel away west on a chilly Ohio street 50 years ago would someday catch up with him and ride, side by side, like he always wanted to do. How proud can a Mother be? Or a sister? Or a wife? Anyone who reads this can only guess and then realize lives are to be shared. And how wonderful the word family is when you are blessed with one such as this!